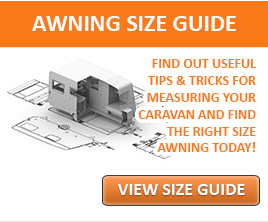 Why do you need to buy a Footprint for your Awning? Do you have a motorhome or campervan awning that has a sewn in groundsheet? Here we explain why a footprint is an essential addition to your awning and the fantastic benefits it can bring. Firstly, an awning footprint is a waterproof groundsheet material which is made to fit the exact size of the bottom of your awning. Most footprints are made from a strong and easy to clean polyester material. They are designed to sit between your awning and the ground and are usually available in custom sizes to fit each drive-away awning model. When setting up your drive-away awning, the footprint is the first thing you need to pitch out. Not only does the footprint give you your own spot of dry ground wherever you go, it makes pitching your awning much easier! If you buy a footprint that is tailor made to the size of your awning, you are able to see exactly where your awning will be pitched and exactly where to peg out the corners. You can achieve a better pitch every time and save yourself time and stress. Once you have pegged the corners of the footprint, erect the awning on top and adjust the position of the awning accordingly when attaching it to your motor home or camper van. A footprint helps to protect the bottom of your drive-away awning from tears and snags if there are any sharp objects on the ground and in turn prolongs the life of your awning! A footprint can also add a substantial amount of extra warmth and waterproofing to your drive-away awning, adding another layer underneath. Just add a good inflatable air bed and an awning carpet and you’re guaranteed a cosy nights sleep! Finally, the footprint will help to ensure your driveaway awning groundsheet stays relatively clean and dry. This means a lot less hassle when it comes to packing your awning away and less cleaning to do afterwards. Our verdict: A footprint is an inexpensive but excellent investment that will save you money in the long run and make trips away with your drive-away awning much easier and stress-free! !